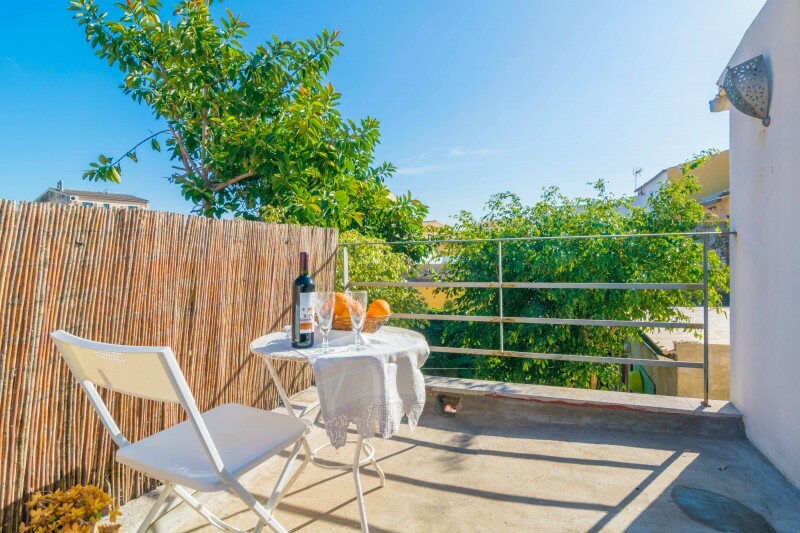 Set in Binissalem near the Tramuntana mountain range, this lovely town house with private pool can comfortably accommodate 6 people. 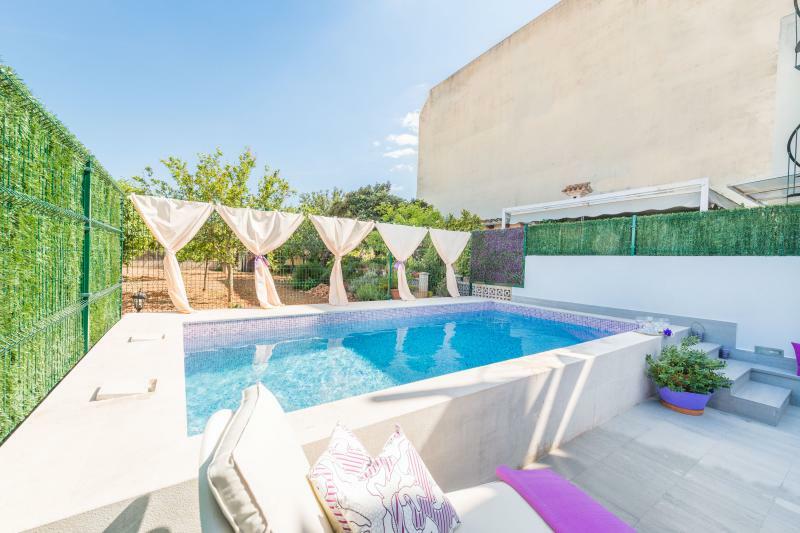 This town house is perfect for authentic holidays in the heart of Majorca. The 6.5m x 3m salt water pool with a depth ranging from 1m to 1.5m is surrounded by a garden with several sun loungers. You can lay sit under the trees and play with your children. Maybe you fancy a tasty barbecue? There's a beautiful porch where you can enjoy great al fresco dining. The house is in the town and there are next-door neighbours. The house has been renovated in 2017 and offers accommodation on 110 m2 and one floor. When entering the house you'll be in the modern sitting-dining room with open kitchen. Sit down on the sofa and enjoy a quiet evening, maybe watching TV (satellite channels) or having lunch with your loved ones. There's a dining table with 6 chairs. The well equipped kitchen includes a gas hob and some utensils. The house also offers a washing machine, an iron and an ironing board. You can choose between three simply decorated bedrooms, two with a double bed and one with a bunk bed. All three come with a closet and a fan. There are two baths with shower as well as a cot and a high chair in case you come with your baby. Located in Binissalem, you will find everything you may need nearby like some shops, good restaurants and Spanish tapas bars where you can try our Mediterranean cuisine. The freeway is easily accessible so you can visit more spots on the island. The next sand beach is 25 km away in Palma and it is called Can Pere Antoni. Besides, you could visit the beaches of Alcúdia, Pollença and Can Picafort. The surroundings of Binissalem are wonderful for hiking, cycling and excursions by car through the Tramuntana mountain range. Note: We cannot accept guests under 28 years old, unless they are accompanied by their parents. We need copies of the passports of all guests in order to accept the booking. An extremely stylish renovation of a classic Mallorcan villa with just the right blend of old and new. The whole place was very well designed and thought out down to the tiniest details. 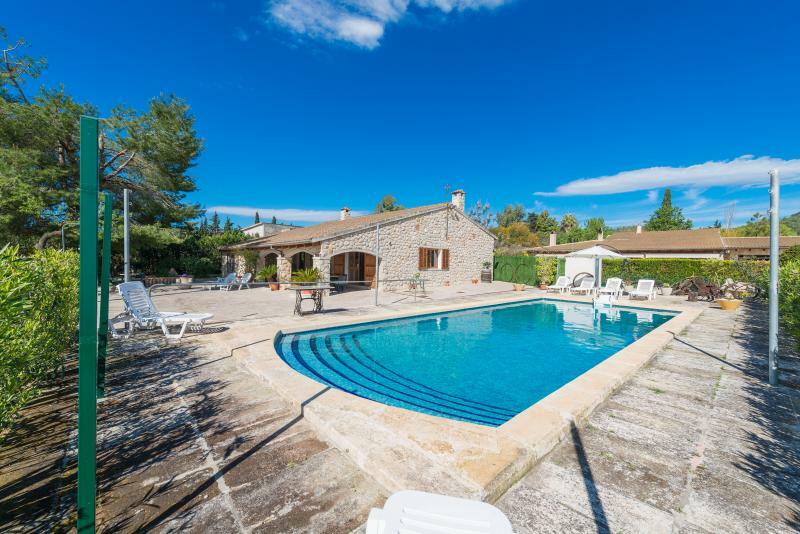 Even though it is very central in the village it was very quiet with a fabulous garden and pool area, with a very handy bakery right outside as well as private parking space, which is unheard of in the villages. Easy walking distance to some lovely bars and restaurants and supermarkets. Everything in the villa felt brand new and sparkly clean. Even though it was too cold to use the pool it was lovely to sit by it in the afternoon sun. We even had 3 pet tortoises to feed! Isabel & Joan the actual owners of the property visited a couple of time to make sure things were OK and were a lovely welcoming couple. We would loved to have moved in permanently . Highly recommended. - El termostato del agua caliente, a veces sale fría. + Cocina y baños modernos, cómodos y limpios.